Now to the fun stuff. Did you know there are two times a year when people are more likely to update their homes? Those two times are April/May and September/October. The latter is generally in response to the impending holiday season and the spring refresher is because so many of us equivocate spring with change. And change can be very, very good. 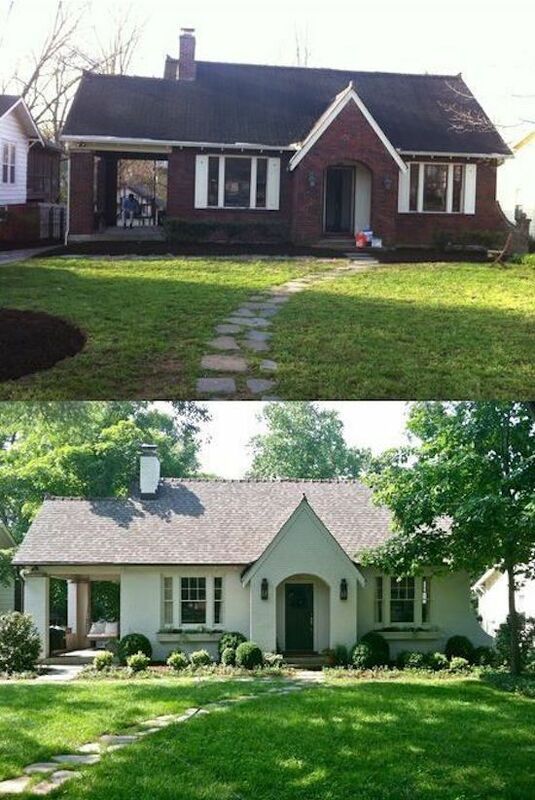 Our first remodel took place in the spring. It was a fabulous time to update the house (then it was 76 years old). We did wiring, plumbing, roofing, flooring, walls…you get it everything. The kitchen was totally gutted and made over. I’m still pretty thrilled to have my non white kitchen. I will never forget sitting down with the designer and saying, “I don’t want white.” To which he responded, “Really? Everybody wants white!” And I said, “Well you will learn quickly I’m not everybody.” (Our kitchen is chestnut.) But that’s kind of me, a little left of center with trends. It has been three years since our remodel and here I am today sharing a laundry list of sorts of updates that I’m ready to make (but probably will not quite yet) of our home. Maybe you’re in teh same boat – ready to update but not quite there mentally and fianncially (hahaha mind and money money and mind, pass the gin and juice!) I also decided to throw in some other updates that may not exactly pertain to my dwelling but I just love to share that may be for your structure. Let’s go big first, ok? For 10 years we have been really (very, extremely) blessed that my mom has had a pool. It has been a great way to get exercise and entertain the kiddos from June-September every year. My daughter learned to swim in my mom’s pool and it was one of my son’s very first outings after coming into the world. We adore the pool. Unfortunately, the pool is now a thing of the past. My mom is moving and that is leaving us high and dry (get the pun) as far as summer water happiness going. If it was feesible we would put in a pool of our own but at this time it just would make no financial sense. So mama is buying a membership to a private pool and we will all cry as load up and drive 15 miles to go swim a little with strangers. The pool pictured is one that would fit perfectly, one day, in our back yard. 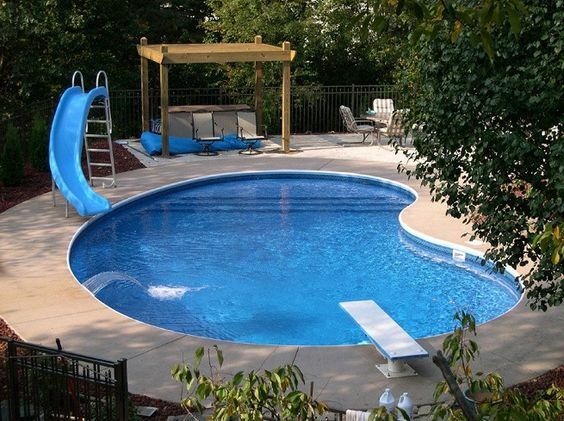 It is a bit smaller than the traditional size inground pool and I just love the circular shape. If you have a pool you need a pool house. 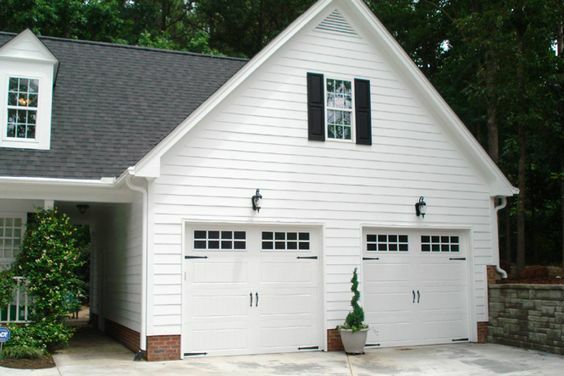 You also need a garage for your vehicles if you faile to add that one when your house fell down a few years ago. If you have kids then I think a bonus room is needed too. Especially if you have a tween who wants to have friends over and they scream and laugh way too loud constantly. 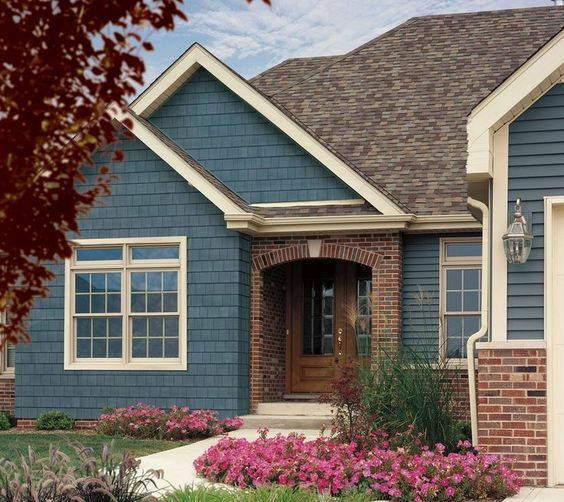 Please make sure your exteriors match. This is now a segue into talking about exteriors. White Wash – This is a favorite and it is quite popular in my neck of the woods. This technique will not break the bank and only requires lime concentrate, water, and table salt. German Smear – I personally love this. German Smear – Take your white wash a step farther and add in this popular style of finishing for an even lovelier touch. German mortar consists of buying WHITE mortar and going over your white washed brick to get that smeared coverage. You can also opt to not white wash first an just do this over your colored brick. Job well done on this brick painting job. Wood exteriors – why did you decide on wood? I grew up in a log house and I vowed never, ever, ever to live in another wood anything. However, if wood is your deal then is it time to stain it? Stain isn’t life long, friends. This applies to decks as well. And yes, I do have a one hell of a deck/porch. The fun part of vinyl and wood is that you can alter the appearance by choosing to go a different color than the regular run of the mill white, sand, and brown. If this is the year to revinyl your hoe maybe you want to spice it up. Roofing – Is it time to replace a shingled roof? Metal is quite popular, economical, and green. You have other “green” roofing ideas but be warned they will cost you a lot of dollars. Windows- If this is the year you update your windows make sure you get ones with lifetime warranties. I say this especially to moms of kids who play baseball, softball, golf, etc. If you have an especially dark room in your home that could benefit from some natural light (I do!) then this could be the season you add in a new window here or there in your home. 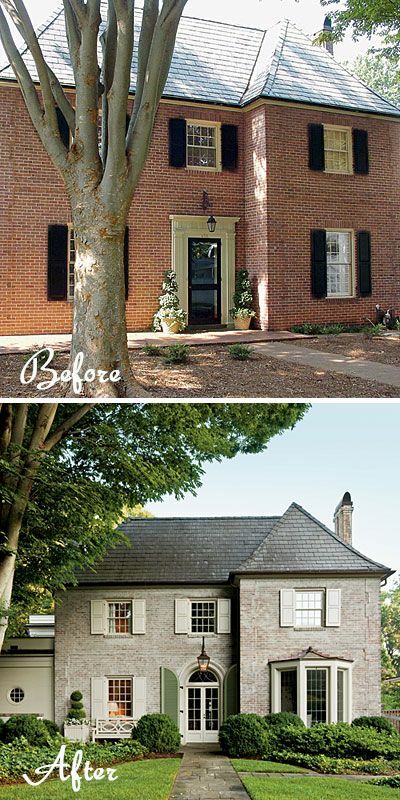 Shutters – An easy update, maybe you just need to freshen up the paint on them or maybe you need to replace them all together. 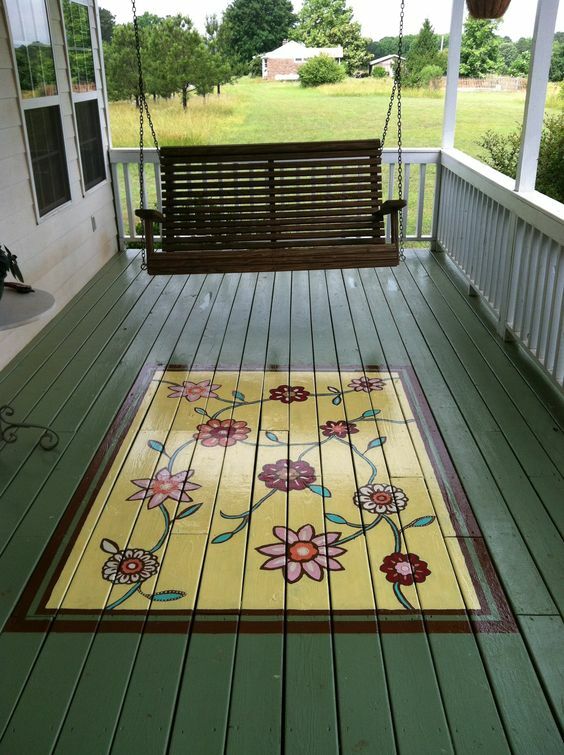 This makes a huge difference to the curb appeal of your home. Landscaping – You know me – we will have a whole other post on this later. Next postPin 5 or 10….yeah 10. We were just talking this weekend about what we’d spend lottery winnings on. I’d spend the money on the inside, as our outside is in fairly nice shape. I’d get some landscaping done, but I’d turn my kitchen into the Mexican hacienda paradise I’ve dreamed of! 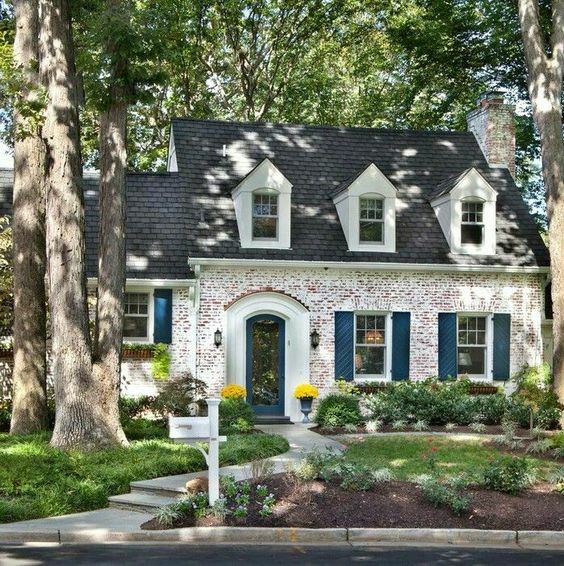 I love homes that get whitewashed- definitely a beautiful update! Spanish kitchen, swoooooon! If I won the lotto – I would pick up and move but the husband wouldn’t so I guess I need to recalculate my plan. LOL! Nooooo your mama cannot take away your pool! Well looks like you’re moving in with us when house is complete, still in planning stages but ya know, you gotta break it gently to the Fam that the master mama of all goodness is moving north, lol!! The German Spear….in LOVE!! My sentiments exactly on mama selling her place. Grrrrrrrr! OK I’m moving up there. Can we buy a lake house and winter in Florida? I am all about the pool and the pool house. I am adding those to our must haves for the new house :P. I need you to come help and motivate me to get this home ready to sell. I wish I could come out! It would be a joy! I would love to have a pool and pool house. These upgrades have me drooling over here!